As the oldest stones in Mt. 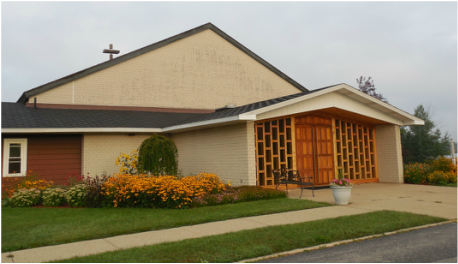 Olivet cemetery attest, the Catholic parish of St. Philip Neri has existed over 100 years. In that time, 32 priests have served as head of the parish. In 1880 Father Niesen lived in Reed City and built a church on the corner of West Park and North streets. He was followed by Father Baruch. Later the parish became a mission - first of St. Ann's in Cadillac. In 1888 the parish became a mission of St. Mary’s, Big Rapids. At that time St. Mary’s had 14 missions attached to it. Fr. Thomas J. Delanty was assigned to St. Philip Neri. Since the coming of Father Anthony Schumacher in 1903, St. Philip Neri has had a resident priest. It was at that time St. Anne Church in Paris became a mission of St. Philip Neri. As the parish grew from a nucleus of early settlers in the 1800s, a brick church was built in 1922 at Chestnut and Bittner that seated 148. More Catholics came to Reed City with the opening of the oil fields and the coming of new industries. This made a larger church necessary. Our present church with room for 430 opened with a Mass on December 17, 1961. The rectory and meeting rooms and offices were added the next year. Early religious education was mainly children learning about their faith from parents or at sporadic classes before and after Mass, taught by the priest or visiting nuns. In 1947 St. Philip's School opened in makeshift quarters in the church basement and the house next door, where the Notre Dame teaching sisters lived upstairs. But there was nothing makeshift in the quality of education, as many present parishioners know who attended that school, and who remember Sisters Liboria, Justin, James, Mildred, Jolantha, Gaudentia, Mildred and many more. 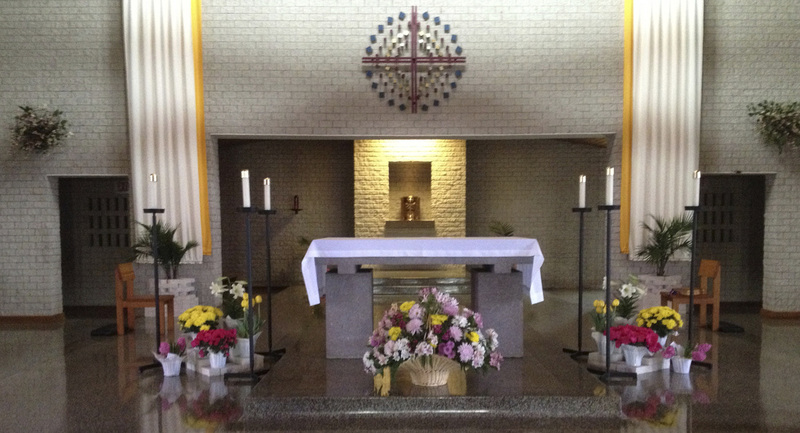 The shrine to Our Lady of Fatima on the south lawn was built by Sister Liberia and the school children when the present church property was acquired. In 1948 a new school, built in great part with unpaid volunteer labor, opened in November with four classrooms, an office and a kitchen for hot lunches. In 1970 when it was no longer feasible to keep the school open it was leased and later sold, to the Reed City Public School, and more recently has become the new home of the Reed City Library. After the school closed, all children were enrolled in religious education classes, staffed by parents and other church members Now, as the parents are more closely involved in their children 's religious training, they are also fostering their own. As the priests lead the parish, the people form the Body of Christ. All that the parish is and has come to be has happened because of the freely given time, talents and tithes of parishioners. May we continue as Christ's followers in genuine love and concern for each other and for all the community. At the top is the hand of the Creator bringing about the creation of the heavens with sun, moon and stars. In its downward ray of light the birds appear. At about eye level the figure of human surrounded by the animal and the fish in the water. T the right is the symbol of the tree with the serpent, men fall from grace. This window speaks of faith: God tests Abraham, shown with the angel staying Abraham’s hand symbolized by the fallen knife through the rope and the ram in the center. Represented is the Holy Spirit in the form of a dove descending with the seven gifts, shown here as flames. Below are two symbols representing physical nourishment (basket with loaves of bread) and spiritual nourishment (the chalice, communion in Christ). The keys and stole is the symbol for the absolution. The window shows in its composition an upward motion. Beginning at the bottom with the crown of thorns drawn onto cover of the tomb. This is symbolic for Christ’s crucifixion. Rising from the open tomb – the bird Phoenix (rising from the ashes) – symbolizing Christ’s resurrection and ascension to heaven. The angel pointing toward Christ’s birth and his humble surroundings, as symbolized by the manor with straw and candle. Above, the Star of Bethlehem showing the way to the Tree Wise Men from the East to pay homage to Jesus.